Are you tired of sweeping the traditional way? Do you need a vacuum for hardwood floors or light carpet? 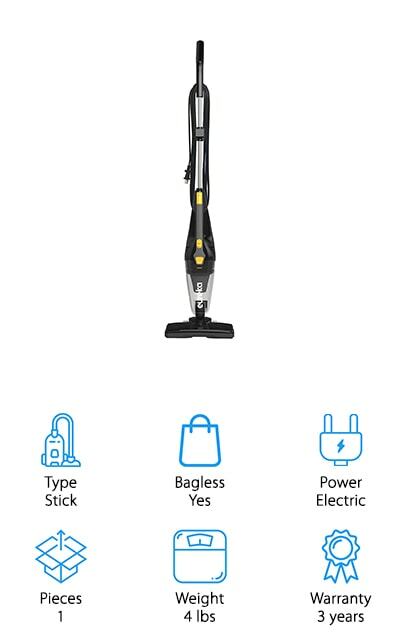 An electric sweeper might just be for you! These lightweight, highly-portable machines are made to make your cleaning life easier. Many of them have similar power to an upright, bagged vacuum at a fraction of the cost. Your linoleum or tile floors will never look better! Here are some things we looked for in making this electric sweeper buying guide. Type: Most electric sweepers are going to be stick vacuums. They are called this because the main body of the vacuum is a stick just thick enough to cover a power cord. They are lighter and easier to maneuver. Bagless: Bagless is a much easier option for an electric sweeper. Changing out bags every time you want to sweep can get expensive. With a bagless cleaner, you only have to empty out the container when it gets full. Power: Cordless sweepers need to be charged, but they are portable and you won’t have to tangle with a cord. You can use an electric sweeper for longer but it needs to be plugged into the wall to run. Pieces: Some electric sweepers come with additional accessories that clean in tighter places, or are more suited for picking up pet hair. Cordless sweepers have chargers also. These are extra pieces that would come in the package with the sweeper. Weight: You aren’t going to want an electric sweeper that weighs more than your upright vacuum cleaner. Lighter is better with these appliances. Of course, cordless machines will weigh less than electric ones, and the attachments will add extra weight. Warranty: The last thing you want is to be left without a sweeper if something happens to yours. Warranties are put in place to guarantee the product and keep you safe if there’s an error in the making of your sweeper. Those are some features that you’ll want in an electric sweeper. 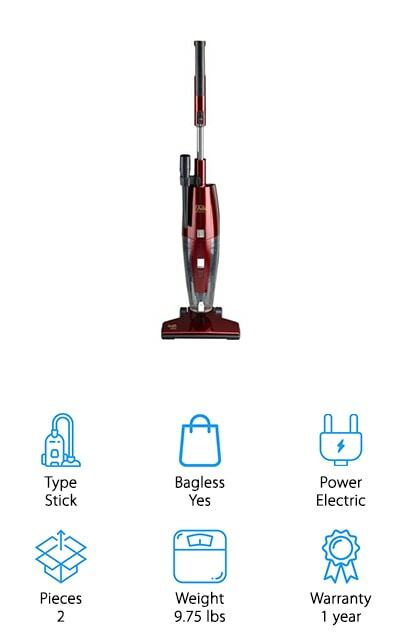 Now we can get to the floor sweeper reviews! As always, you can check out our top pick and budget pick first. They are the best we found in our research! However, there are plenty of other great sweepers on our list, so try and read to the end if you can. Some of these vacuums will really blow you away! Okay, let’s get to the reviews! 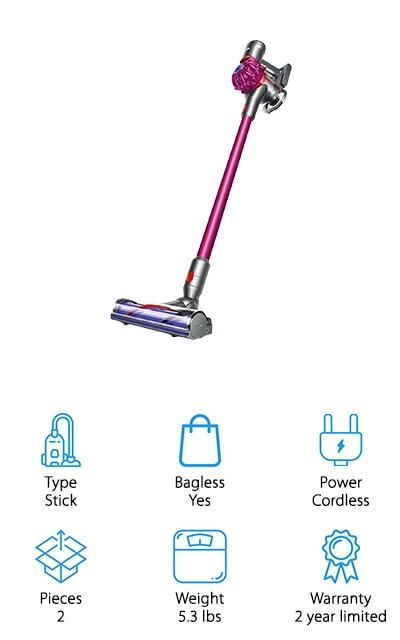 Our top pick for best electric broom goes to the Dyson V7 Motorhead. This cordless vacuum has bristles on the head for cleaning deep down into your carpet. It charges via the docking station, and a full battery will last for up to 30 minutes of continuous cleaning. The docking port hangs conveniently on a wall to keep your cleaner handy. There’s so much to love about this powerful electric sweeper. But that’s not the best part! This cleaner will transform into handheld mode with no effort at all. Take the head off to reach ceiling fans and cobwebs in ceiling corners, or take the stick part of the cleaner off entirely and attach one of the included accessory heads to pick up pet hair or dust your baseboards. We loved everything about this product! On top of this, the sweeper is bagless, so you only have to empty the canister when you are done using it. For a cheap electric sweeper, the Dirt Devil Simpli-Stik is phenomenal! This cleaner is simple, powerful, and comes in two beautiful colors. The bagless design means that dirt is easier to clean out of the container when it gets full. On top of this, it’s a corded sweeper, so it has all of the power you could want for as long as you need to clean. Plus, the cord is a whopping 16 feet long, so you won’t get hung up on it! The wheels roll smoothly across any surface in your home, including tile, wood, and carpet. You only have to detach part of the bottom of the device to make it into a handheld cleaner for tighter spaces. It even includes an onboard tool for getting into crevices. You won’t have to replace the filters in this vacuum – the filter rinses out easily so you’ll always have the best clean possible. And it’s only about 4 pounds! Bissell is one of the forerunning brands for cleaning devices, and their PowerEdge Vacuum is no exception. 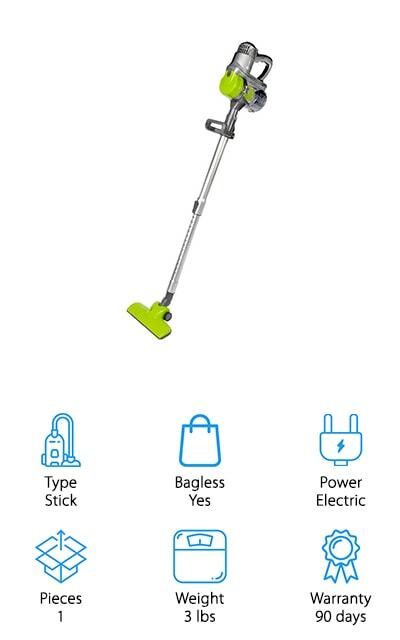 The unique design of the cleaning head makes this one of the best electric sweepers for sale. The head is split into a V shape, allowing this vacuum to clean around table legs, under furniture, and right up into tight spaces. There is an amazing amount of swivel in the head of this sweeper! Even the edges of the cleaning surface attract debris and dirt, making this superior to the stick sweepers even a few years ago that only had one suction area. The design also makes it the best sweeper for pet hair. It doesn’t come with any attachments because no attachments are needed! 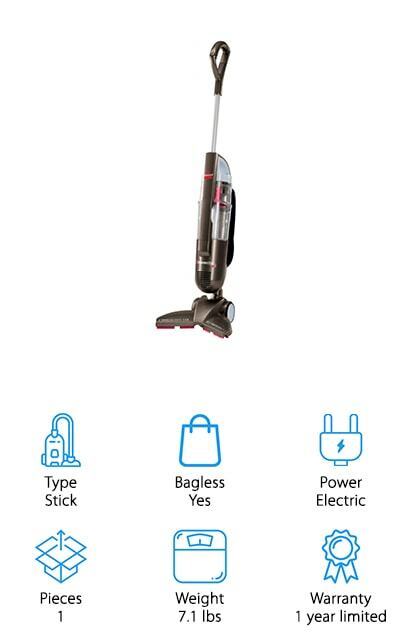 This cleaner has the power you want with a unique design and extremely affordable price. It is electric, but the power cord reaches an incredible 20 feet, allowing you plenty of room to clean without moving plugs. Our carpet sweeper reviews wouldn’t be complete without featuring a Hoover! The Linx cordless vacuum has all the power of an electric model packed into a cordless package! There is a whole line of Linx products from Hoover, and all of them use the same battery. This makes the power source interchangeable and versatile! There are bristles on the edge of the cleaning head, making it perfect for use in tight corners or for baseboard cleaning. This cleaner utilizes powerful suction to deep-clean your carpets and floors like a regular vacuum cleaner. As a bonus, the cup that stores the dirt has a bottom release function. Keep your hands clean while getting rid of your dirt! The coolest feature is the battery gauge, so you can track how much life is left in the battery you’re using. This is an amazing electric floor sweeper! Hoover has loaded this cleaner with features, making it one of the best sweepers we reviewed! Next on our list is another amazing cordless vacuum. The Shark Ninja Sweeper is a more traditional model, reminiscent of the beginning days of electric sweepers. That alone is pretty cool. But this cleaner is stacked with features! Two available speeds make cleaning up a breeze, from large particles down to dusting. This machine is light but still manages to maintain a wonderful amount of suction. The container can be cleaned hands-free – there is a button on the handle that releases the bottom of the device. The handle can fold in half, making it easy to reach under furniture and other fixtures without bending over. The angles this vacuum can reach are amazing! The squeegee feature on the edge makes it the best sweeper for wood floors, as it can reach and scoop up more dirt than suction alone. But that’s not the best part! The battery, once charged, will last for up to 55 minutes of continuous cleaning! Say goodbye to heavier vacuums! The BESTEK 2-in-1 Stick and Handheld cleaner is under 4 pounds. Coupled with a 16.5-foot cord, you can clean several rooms without unplugging this thing! It has powerful suction that gets up more than just the surface dirt. The design is pretty standard for electric sweepers. The cup comes off of the handle to make a handheld cleaner that’s good for pet hair and tight spaces. It’s perfect for cat litter, dry food messes from your kids, and even standard dusting! You’ll get more than your money’s worth out of this stick vacuum. Even better, it’s easy to store, so it’s never in your way like a full-sized vacuum. The filter is so easy to clean; you’ll always get the best performance out of this machine! 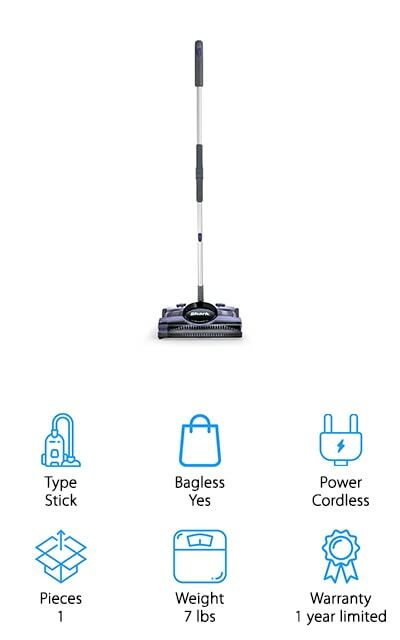 Pick up all manner of messes with this lightweight, no-fuss electric sweeper. It will top your expectations and make your floors spotless without breaking your bank! 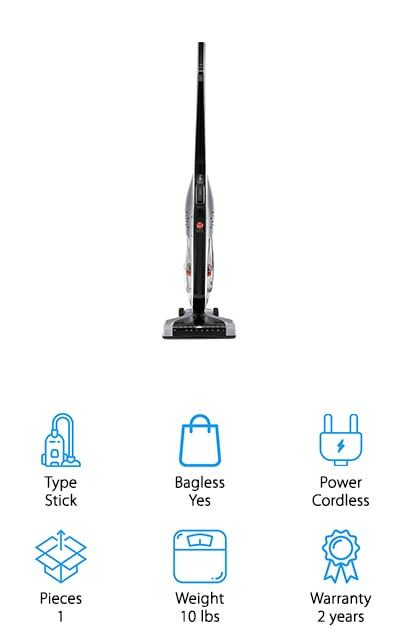 The Fuller Brush Spiffy Maid electric broom more than matches its more popular peers for features and utility. First, let’s start with the cord. It’s super long! We were amazed by the full-length, 30-foot cord. You could get your whole house swept without the hassle! 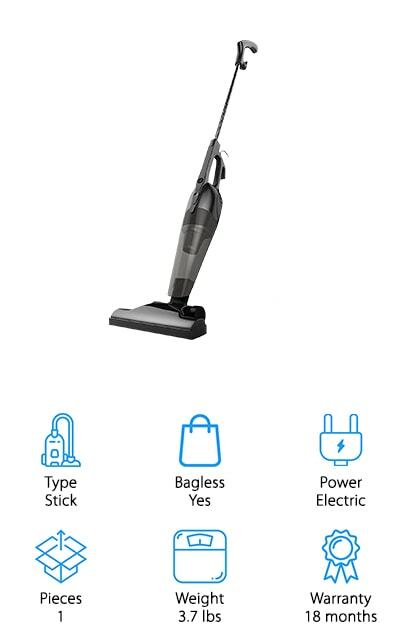 The motor is powerful for a stick vacuum, ensuring that all of your dirt will get sucked up in no time. The dust tray holds a lot of debris, and we mean a LOT. It’s easy to empty, the filter is simple to rinse out, and the unit snaps back together incredibly easily. There’s a removable handheld cleaner and an on-board crevice attachment for furniture and tight spaces. The wheels are rubber and won’t mark up your floors. For extra reach, the handle telescopes out to get to those elusive places. Honestly, this is one of the best carpet sweepers we reviewed. The features and power of this machine really blew us away! The Eureka Blaze 3-in-1 is one of the best floor sweepers we encountered during our reviews. It has an incredible amount of control in the swiveling head. It’s perfect for different types of floors, from hardwood to laminate, tile, or short carpets. The entire filtration system is washable. When coupled with the deep-suction power of this vacuum, this means that you can really do some amazing work with this machine! We loved the 18-foot power cord, which would easily allow you to clean an entire room without missing anything. The head has a 9.8-inch cleaning width to get broader areas of floor done! Here’s the kicker: there are three different devices hiding in this electric sweeper. The stick vacuum is the main part, but can also be a stair cleaner or handheld, making it perfect for any type of floor or furniture cleaning you need! From dusting to food spills, the Eureka 3-in-1 really shines as a vacuum alternative. Rollibot is a fairly new name in the floor cleaning world, but it is doing wonderful things for electric sweepers! At just 3 pounds, this cleaner is extremely lightweight and portable, as well as being super quiet, making apartment use a breeze! The huge dirt canister carries a lot of debris and will empty with the press of a button. The filtration system consists of two parts, and it’s extremely easy to take apart and rinse. That’s not even counting some of this sweeper’s coolest features! The handle telescopes from its normal 19 inches to a full 30 inches for cleaning high-up places, ceiling fans, and far under the bed. Even better, there are six different attachments for regular floor use, pet hair, fabric and furniture, dusting, brushing away tough messes, and getting into tight spaces. You’ll have a mode for every use you could possibly think of! Power and price combine in this amazing device! Electrolux makes one of the best cordless sweepers on our list. For starters, this machine looks really cool! The lithium-ion battery charges extremely fast and provides extended cleaning of up to half an hour. 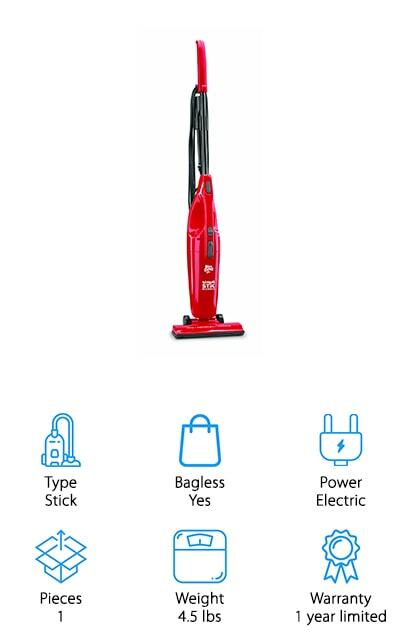 This sweeper is meant for pet care, so you know it can pull up a lot of dirt and debris from even the cleanest floors. You never even have to worry about the brushes getting tangled with debris because the rollers clean themselves with the press of a button! You only need to press a button on the handle to release the hand vacuum. Attach the smaller head and you’re good to clean pet hair off of furniture. One of the features we absolutely love is the ‘headlights’. There’s a panel of LED lights across the front of the floor-cleaning head so you can see where you need to go. And getting there is super easy with the swivel navigation system. This machine is hot!